Open Letter to Hon. Mahen Seeruttun: Wake Up! Congratulations! 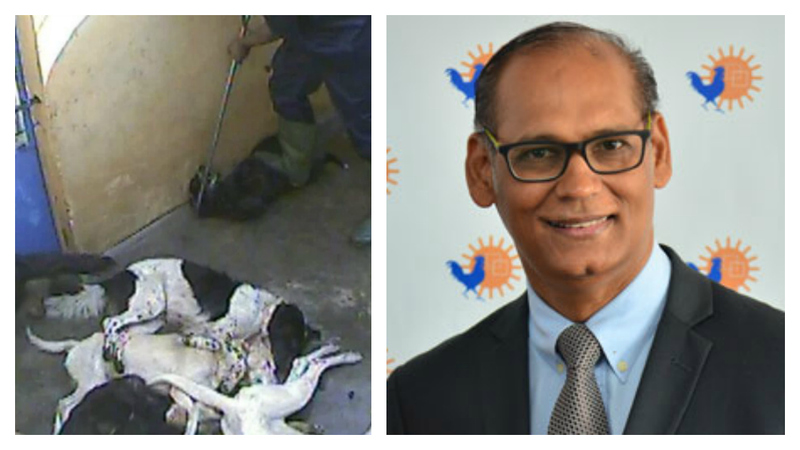 Thanks to your ministry and to the unflinching support of the Mauritius Society for Animal Welfare, Mauritius has once again hit the international headlines when it comes to animal welfare! Ever since two animal welfare charities have released a video footage which shows the treatment dogs receive at the MSAW pound, the image of Mauritius as a purgatory for animals is more concrete. While countries of the world are adopting new measures to ensure that the rights of animals are respected, Mauritius brightly falls into regression! In the video we see caught dogs collapsing and hear them howling as they are “euthanized” by workers. The workers throw the dogs to the ground, step on them and brutally administer them injection which is said to contain a ‘cocktail of drugs’. Any human being will find such scene difficult to watch. However, it will not be surprising if you are not moved by this and turn a deaf ear to the cries of these animals. But we will not remain indifferent to what we qualify as a blatant act of cruelty by the Mauritius Society for Animal Welfare towards these voiceless beings that deserve a second chance. Section 3(1) (a) of The Animal Welfare Act of 2013 says that “any person who (a) tortures or otherwise treats an animal in such a manner as to subject it to distress, pain or suffering, or causes or permits an animal to be so treated…(c) administers an injurious drug or substance to an animal, or willfully causes or permits any such drug or substance to be taken by an animal” commits an offence. If we consider this section of the Animal Welfare Act of 2013 and scenes shown in the video, it will not be wrong to say that your ministry, under the Mauritius Society for Animal Welfare, has violated the Animal Welfare Act. Your ministry can no longer deny that it is not carrying out a mass catch and kill campaign. The truth cannot remain hidden for long. However, mass catch and kill campaign is not a solution to the predicament of stray animals. Several countries around the world have tried to end the problem of stray animals by adopting a mass catch and kill campaign but no concrete results have been achieved. In 2015, Pakistan carried out a mass killing campaign against stray dogs but it did not yield concrete results. The solution to the predicament of stray dogs lies in spaying and neutering and responsible pet ownership! Spaying and neutering is the only, 100% effective solution towards the lingering issue of stray dogs in Mauritius. It is time that you acknowledge this and that your ministry starts to work on such campaign in a more civilized manner. Several animal welfare organizations have in the past sought your ministry to remedy the situation, but our voices were unheard. Maybe instead you refused to hear the voices of these sentient beings who are killed everyday because they do not bring you votes. While your ministry and the government want to preserve the image of a ‘paradise’ Mauritius, that image is already shattered. The unfair treatment animals receive and the inability of your ministry to remedy the situation have only contributed to make matters worse. You know very well that the video footage is only a microcosm of the cruelty that animals go through in Mauritius and yet, your ministry seems to content itself with the status quo. The country is one of the main exporters of monkey for animal experimentation, your ministry takes pride in it. Mauritius launches a bat culling campaign, your ministry takes pride in it! Animals are mercilessly killed in slaughterhouses, your ministry takes pride in it! Wake up! All animals are equal and there is a more humane solution to help solve the issue of stray dogs in Mauritius. We request you to investigate further into the happenings at the Mauritius Society for Animal Welfare and take necessary actions. Together we can build a more compassionate Mauritius for our furry friends.